mindSHIFT Review 2019: Is mindSHIFT a Good Hosting? 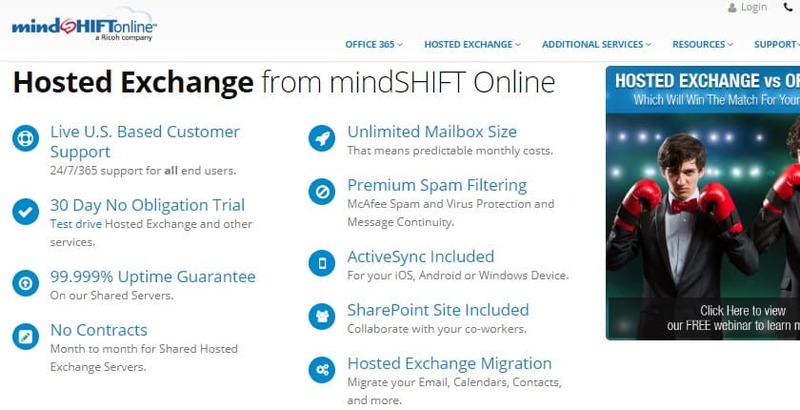 mindShift is an American IT company that provides Microsoft Hosted Exchange for small businesses, cloud VPS, data security, email archiving, and a number of collaboration tools. Fully scalable, its solutions can grow with your business. mindSHIFT is a reputable tech company that offers Microsoft Exchange Server hosting, Office 365, data backup & recovery, premium spam filtering, and ActiveSync for smartphones. Its services are geared towards enterprises and organizations that operate mission critical websites and emails. The company’s servers are co-located in a Tier-4 facility. Moving to a new shared exchange environment can be both daunting and strenuous for a beginner. Luckily for new customers, mindShift helps them to transition with its fast and seamless integration. It will move all your critical emails, tasks, and calendars to its secure online platform. Not every day do you find hosting services that provide productivity tools like Office 365 or a collaboration hub like SharePoint. Add to that Hosted Exchange for managing your emails and contacts, and you’ll appreciate how this company can transform a once dull or disjointed workplace into a place where your employees can work smarter, faster, and more efficiently. Until you lose your critical business data or files, you may never really get to appreciate the importance of routine backups. mindShift carries out daily backups of all files, databases, emails, contacts, and notes. So in the event of accidental deletion or loss, you will be able to restore all data and continue with your business operations. mindShift also provides round-the-clock server monitoring and robust security to customers. Its servers are located in a secure and modern Internap data center, a Tier-4 data hosting facility with hardened physical security and biometric authorization. With an impressive 99.999% uptime guarantee, the company’s servers ensure high availability of customers’ websites and apps. If you’re looking to cut overhead costs and still get full control over your apps databases or new website, you should consider mindShift’s on-demand Cloud VPS servers. They’re cheaper than physical servers and scalable too, meaning you can add more resources or decommission any that you feel are underused. All of your resources can be accessed 24/7 via your smartphone, tablet, or PC. Though mindShift’s hosted exchange is affordable, its VPS isn’t; you’ll pay per user. On the bright side, the company charges zero setup fee on hosted email service. Customers who sign up for monthly subscriptions are not required to sign a contract or make any commitment. Its solutions are scalable and customers get a 30-day no obligation trial. Mindshift provides live technical support to its customers. Its US-based technical support team can help you with website migration and server configuration, among other things. Jean, one of the live chat specialists, shared a link to their IT managed services, which included the option to install Linux or any other OS, just what I had in mind. My only concern is that the knowledge base, which should be an open resource, is locked. mindShift provides stable and secure shared exchange servers and a number of collaborative tools as well as productivity tools including hosted emails to small businesses that want to streamline their operations. Get reliable hosting from mindSHIFT! Wondering how mindSHIFT stacks up against other Web Hosting companies? Enter any other Web Hosting company and we will give you a side-by-side comparison.